One of the biggest concerns facing homeschooled families is how their students will complete high school. I’ve heard that question a lot, as both as homeschool student and a homeschool mom, so I was excited to review Transcripts Made Easy: The Homeschooler’s Guide to High School Paperwork from Everyday Education. 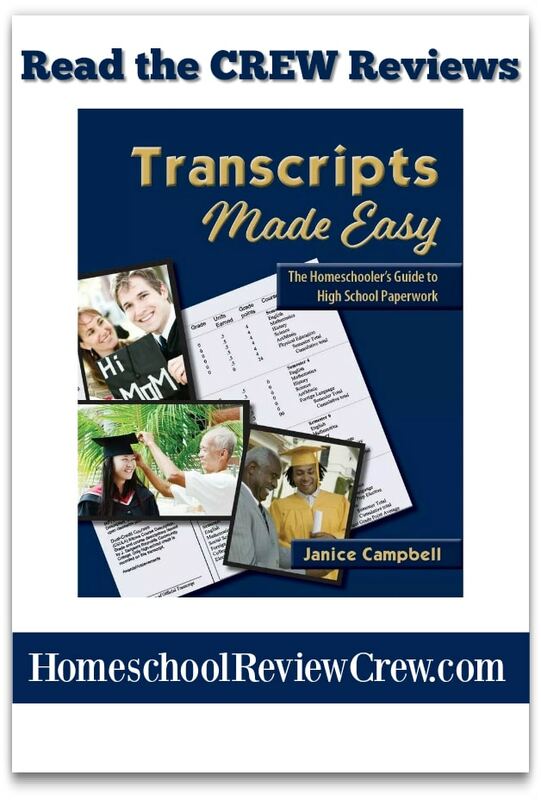 In this book, veteran homeschool mom Janice Campbell addresses every question and concern homeschool parents have about homeschooling high school, creating transcripts, and helping their students achieve their goals beyond graduation. This post contains affiliate links; as an Amazon affiliate, I earn from qualifying purchases. While my daughters are currently a few years away from high school, I completed high school myself as a homeschool student. Reading through Transcripts Made Easy brought back a host of memories about the questions and decisions my parents and I faced during those years. Back then, homeschooling was much less common than it was today. The general assumption was that homeschoolers “finally” went to “real” school when they hit homeschool. And some of my friends did that. However, my brothers and I didn’t want to start public high school. Our reasons for homeschooling hadn’t changed because we were another grade older. We ended up switching school boards and completing high school at home. I do not have a high school diploma, but I do have a transcript of marks. That transcript came from grades my mom assigned to me based on my work at home, and grades I earned by writing the Alberta Grade 12 exams for five subjects. That transcript of marks is what got me into the university of my choice and also helped me land my summer job with my dad’s company. As I read through Transcripts Made Easy, I found myself nodding along with Janice’s advice. In a simple, confident manner, she answers homeschool parents’ questions about this pivotal time in their child’s life. I’d highly recommend reading this guide to high school paperwork before your child starts high school. Even if your child is about to graduate, Transcripts Made Easy can help you navigate that transition. Janice begins by explaining what a high school transcript is and why every student needs one. 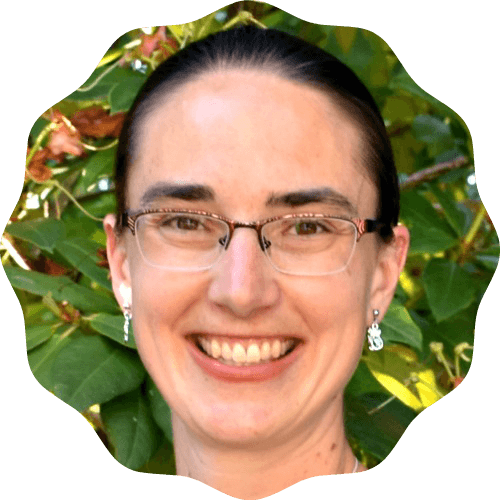 She discusses who will see your child’s transcript (think beyond colleges and universities!) and what exactly needs to appear on that transcript. Transcripts Made Easy outlines the entire process for creating your child’s transcript, from before you begin to teaching high school courses to helping your child apply at their chosen university. If the idea of a transcript overwhelms you, flip to “Where to Start in This Book.” Janice presents a variety of situations you may be facing right now, and gives you advice about what you need to do in that situation. If you’re like me—looking ahead to high school in a few years—read Transcripts Made Easy to get an idea about what you’ll need to do when your child hits those grades. If you need a transcript tomorrow, Janice tells you how to get it done!!! Once question that I frequently heard in junior high and high school was, “What do you want to do when you grow up?” That’s the advice that Janice gives to homeschoolers too: begin with the end in mind. Having an idea about what your student wants to do after graduation will help you work towards that end. Janice talks about some of the advantages of homeschooling high school and what skills (beyond reading and math!) your student needs to learn during these years. Janice also discusses what high school credits are and how to calculate them. For example, when I was doing high school in Alberta, graduates needed 100 credits to earn a diploma. Each course was assigned so many credits. One of the reasons that we wrote the Grade 12 exams was to be “grandfathered” the credits for the Grade 10 and Grade 11 courses. By passing my English 12 exam, I received the credit for it as well as for English 11 and English 10. Another section that caught my attention was “Scheduling Classes.” In this chapter, Janice discusses several different ways that your child can complete their classes. Many of us may still have the idea that our child needs to do one lesson for every subject every day. Janice presents pros and cons for various scheduling ideas, including transitioning your child to a university-style schedule where they do certain subjects on certain days and other subjects on other days. I agreed with her comments that sometimes spending longer, more focused time on one subject is more productive than trying to spend less time on more things. Janice has a brief section on standardized tests such as the CLEP, SAT, GED and others. She says, “You can take exams to gain entrance to a college, to add credibility to your transcript grades, or to get a head start on college.” If you’re considering any of these tests for your student, she includes the websites for you to find more information and also has another book on this topic, Get a Jump Start On College. 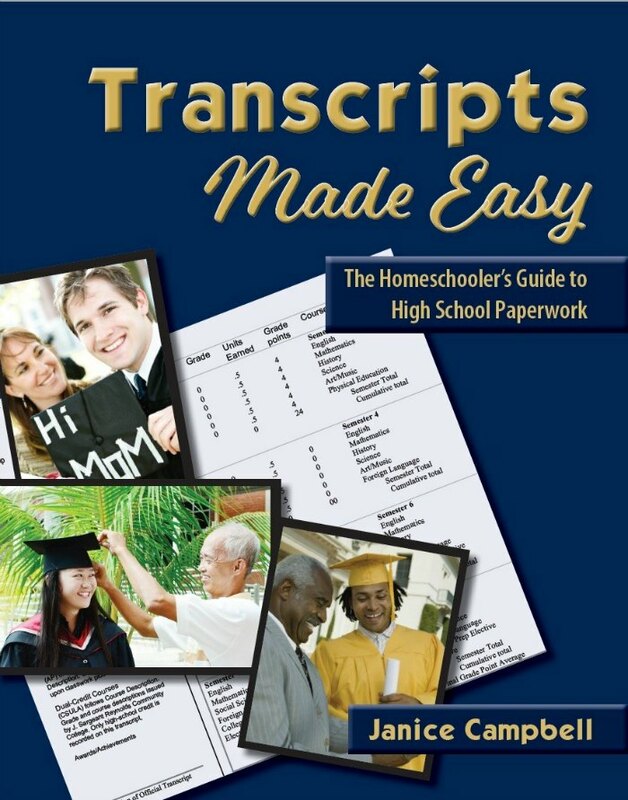 Transcripts Made Easy is not just about getting your homeschooler into college or university. Janice acknowledges that not every career requires a college degree and not every student will benefit from a university education. As I mentioned, I used my high school transcript to get my first summer job in university, because my dad’s company only hired students with a high school degree. My husband was recently asked for his high school transcripts during a job application (and he has three university degrees!). Janice includes an entire chapter covering post-secondary options for your student other than college. My twin brother completed an apprenticeship at a local trade school in Alberta and has worked as a heavy duty mechanic ever since. He’s now started his own company and is greatly respected by everyone for whom he has worked. My younger brother joined the military about five years ago, after finishing his B.A. And I know other homeschool graduates who’ve followed other career paths, including starting as a waitress and working her way up to managing a restaurant. Encourage your children to be creative in their post-secondary goals and ideas. 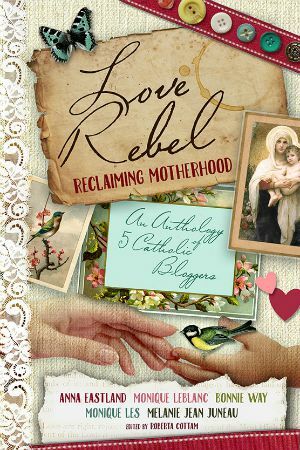 Janice has some great resources for you to explore and consider with your child. Part 5 covers how to create your child’s transcript, with specific, detailed information about what you need to include. Janice provides examples for you to use as you put together your own child’s transcript. She also has fill-in-the-blank templates for you. Finally, Part 6 includes a glossary of terms used throughout this book (and which you may encounter as you navigate high school, graduation and beyond), more resources for planning and learning during high school, and reproducible and blank transcript forms. Overall, this is THE guide to high school paperwork you need if your child is planning to finish high school at home. I can personally attest that it is possible to graduate Grade 12 at home and succeed (even excel!) at university, trade school, and other occupations beyond that. In fact, I firmly believe that a great part of my university success was due to skills I learned as a homeschooler during high school. And the volunteer work I was able to do as a homeschool student (something Janice discusses!) led to my first job after university. If you’re curious how other homeschool moms have used Transcripts Made Easy, check out the CREW reviews here! Transcripts Made Easy is currently in its fourth edition. Janice wrote her first guide to high school paperwork in 2001 because she’d just created her oldest son’s transcript. She says, “It was a harrowing process. I never wanted to have to think of it again!” She’s continued to learn more about homeschooling high school, creating transcripts, and helping students succeed after graduation, and that’s reflected in every update. Transcripts Made Easy is available on Janice’s website and on Amazon. What are your biggest questions as you consider homeschooling through high school? Have you created a high school transcript for your child?